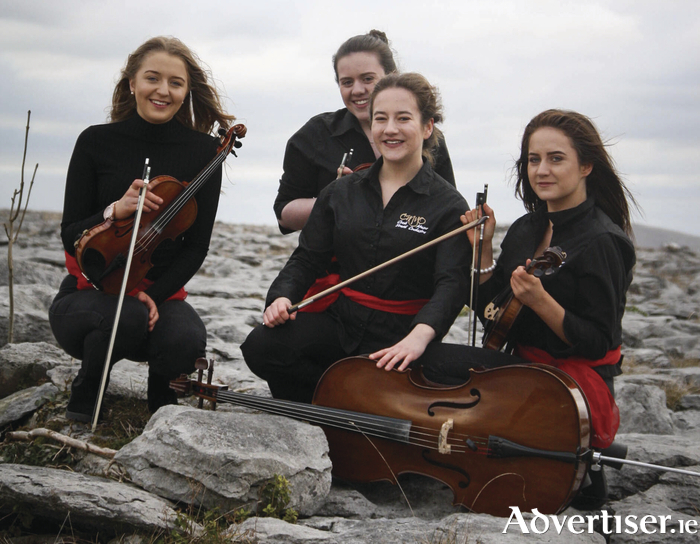 Musicians from Coole Music in Gort (LtoR): Roisin Clancy, Alanna Kenny-Flaherty, Caolainn Feeney, and Cliodna Flaherty. Photo:- Audrey Nestor. THE COOLE Music Orchestra Festival, which celebrates it's 10th anniversary this year, returns on Saturday March 11, with a series of afternoon and evening concerts, in the Gort Community Centre, south Galway. The award-winning festival will this year run under the theme of 'Count Me In'. Orchestras from Sligo, Cork, Galway, Dublin, Ennis, Kilbride, Athenry, Charleville, Headford and Gort performing music from the soundtrack to the Harry Potter films; pieces from Les Miserables; works by Handel and Strauss; and arrangements of traditional Irish music. The grand finale will feature all the orchestras at this year's event being joined by Irish dancers from the Gavin Dance Academy. "We are so proud and excited to present our 10th anniversary performances for our audiences this March," said Katharina Baker, Coole Music and Arts artistic director. "Our festival managers are busy from August to March to get everything into place and around 50 volunteers from Coole Music and Arts are busy on the day making sure all goes to plan."